IBM® Watson® Career Coach is a virtual assistant that aligns your employees’ career goals with your business goals. 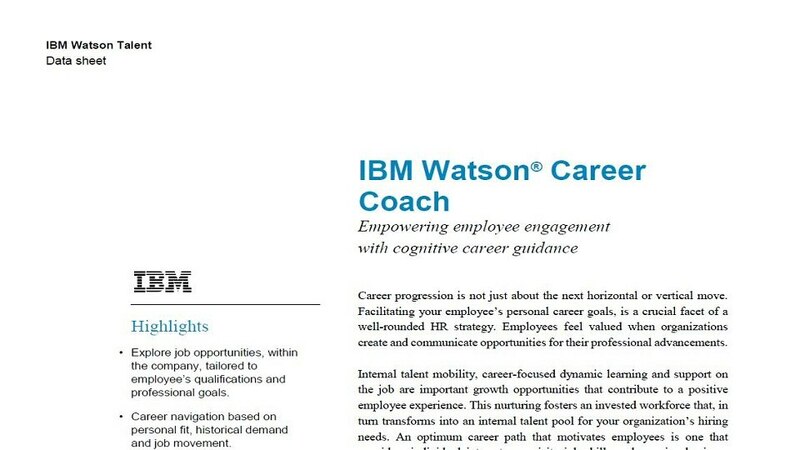 Through interactions and updates, IBM Watson Career Coach learns about an employee’s preferences and interests, makes recommendations for existing job opportunities and offers advice on how to navigate future career moves. It helps employees validate their skills development against career goals and trending opportunities. Cognitive technology helps you identify valuable skill sets and employee aspirations, and work proactively to address current and forecasted talent needs. Retain top performers by providing a clear vision for future growth and advancement in the organization. Provide employees with job enrichment, learning and the resources to pursue career goals. Empower employees to discover where they are and what direction they can go to help grow with your business. Retain top performers and reduce attrition with career development and internal mobility options tailored to the individual. Ask questions and seek information using everyday, conversational language with a natural-language interface. No technical skills required.